The image of Bread and Roses is a symbol of recognizing that it is the right of every individual to be fed and nourished on every level, and that we are not meant to simply scrape by with the bare minimum. In order for creativity and desire to flourish we must make sure we are fed and our needs are met. This symbol comes from a line of a speech given by Rose Schneiderman–a union, labor, and women’s rights activist–that inspired a poem by James Oppenheim. To nourish something means to provide with the food or other substances necessary for growth, health, and good condition. At the Aphrodite Temple of Bread and Roses we will investigate where in our hearts, bodies, and desires we are not getting the nourishment we need. This springtime, in the time of the earth’s renewal, come ask yourself what it is that you need for growth and healing around your sexuality and your life. Where can we nourish ourselves to create sustainable growth, health, and good condition? Bread for all, and Roses, too! 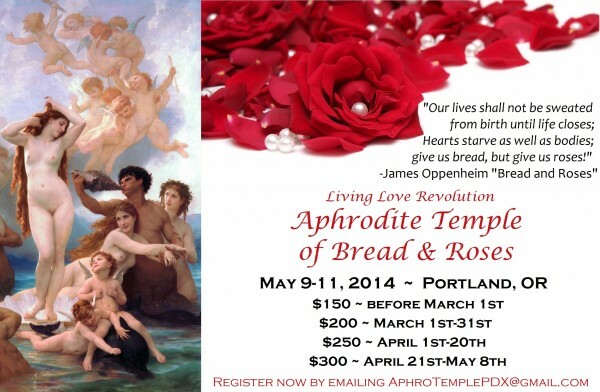 Click here for more information about LLR Aphrodite Temples!